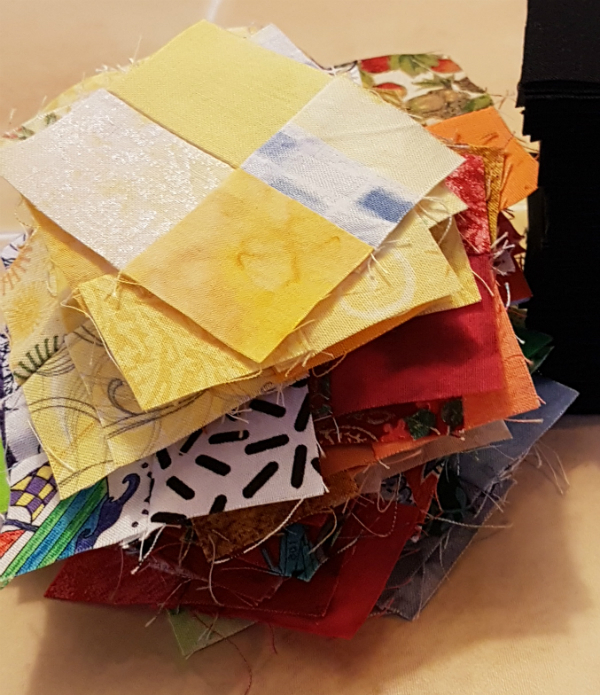 I'm pretty sporadic when it comes to making leaders and enders, but over the past couple of years I've still managed to accumulate a few hundred of these colour-coordinated 4 patch blocks. It was great to start putting these blocks together and already have those centers ready to go! 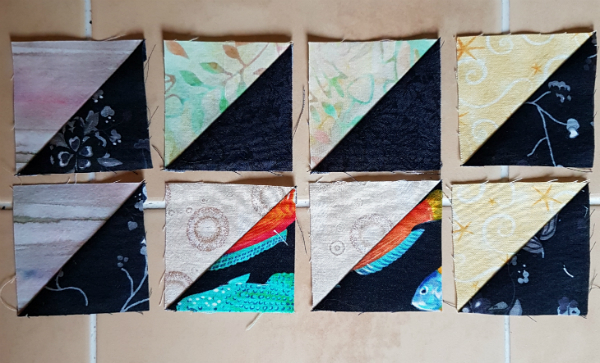 I still have a lot of 4 patches left...enough to make at least 2 more of these quilts, so I don't feel like making more of them right now. I'll still cut the squares, though. It's a great way to use up those little scraps and have them ready to be used for something. And I'll likely use some of the remaining 4 patches to make another version of this quilt with a white, or at least much lighter, background. It's always fun to see how changing the background changes the whole look of a quilt. But what to use for leaders and enders now? 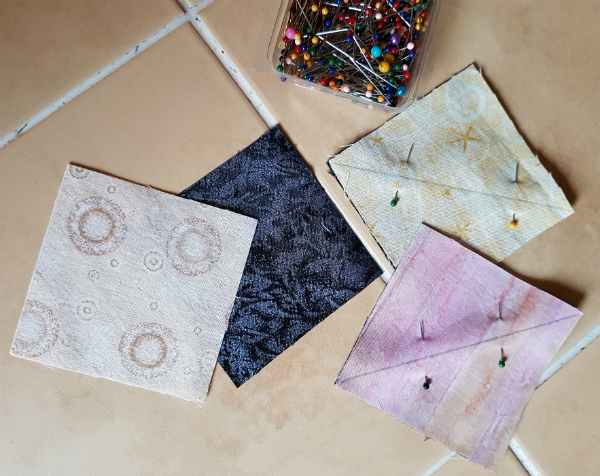 Well, I've also spent the past couple of years cutting scraps into 2 7/8" squares for HSTs and just sticking them in a bag in the cupboard. 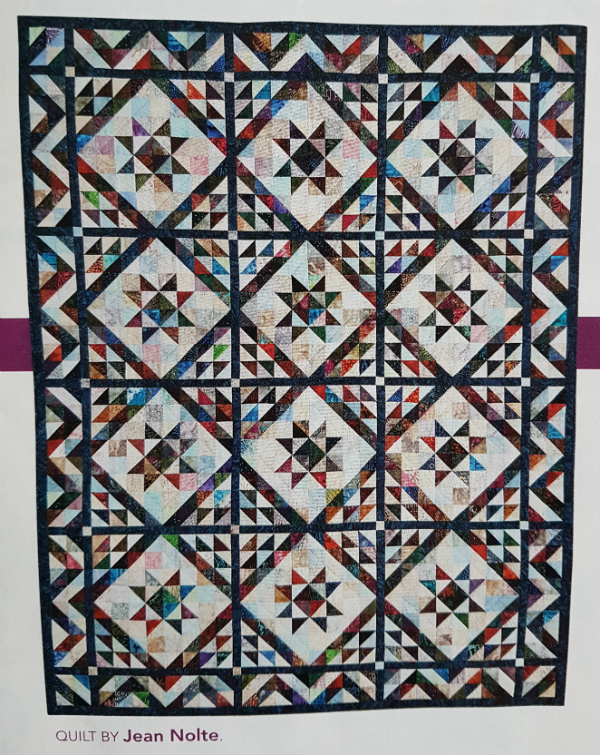 The plan is to use them to make this quilt, Scrappy Triangles, designed by Jean Nolte. I even thought to write the magazine issue the quilt is in on the outside of the bag I store them in so I could find it again easily. For the record, it's in Love of Quilting, Nov/Dec 2011, which means I've been cutting these squares for almost 6 years 😝 Obviously I haven't been overly diligent about cutting! I haven't counted my squares, but I know I don't have enough for the whole quilt. 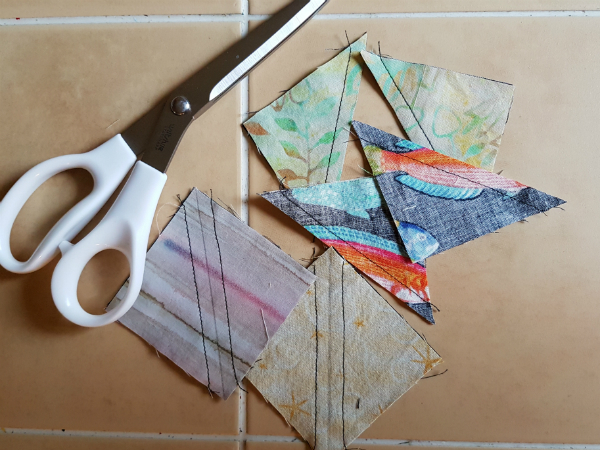 I can definitely make a lot of HSTs, though, so there's no reason not to get started. Besides, the way I make leaders and enders, this will take a long time anyway 😊 That'll give me plenty of time to cut more squares. 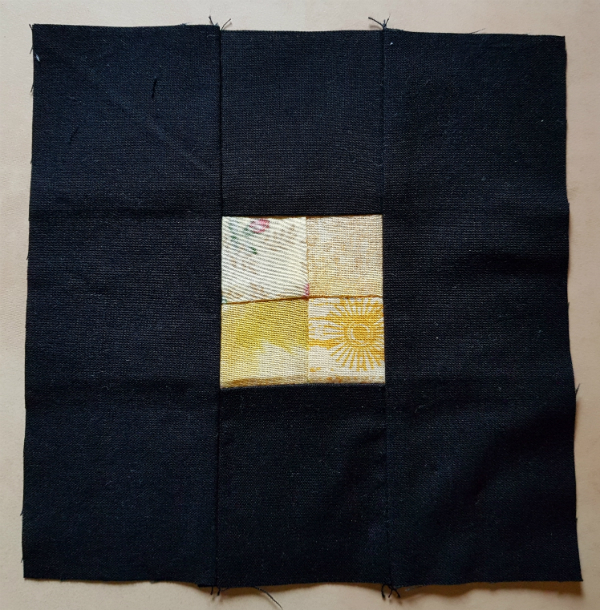 For now, since I'm using black thread to sew my black blocks together, I'm choosing dark squares that are black, or pretty close to it, so the thread won't show. 8! It's a start, right? Do you make leaders and enders? If you do, what blocks do you like to make most and what do you like to make with them? Hi Leanne, I use leaders & enders sporadically too. I like to cut my scraps in 2.5x4.5 rectangles...I'm not into tiny pieces. Anything smaller than that size I throw into a large pillowcase (made from 'what was I thinking?' fabric); when it's full I sew it shut and donate to a local animal shelter. It's a win/win for everyone! Can't wait to see what you're making for January!! It is fun seeing what you do with leaders and enders. I tried that once for a scrap vortex quilt two years ago. It lasted less than a week before taking over and becoming my focus project. I haven't tried it again. I do use leaders and enders! Nearly all the time. 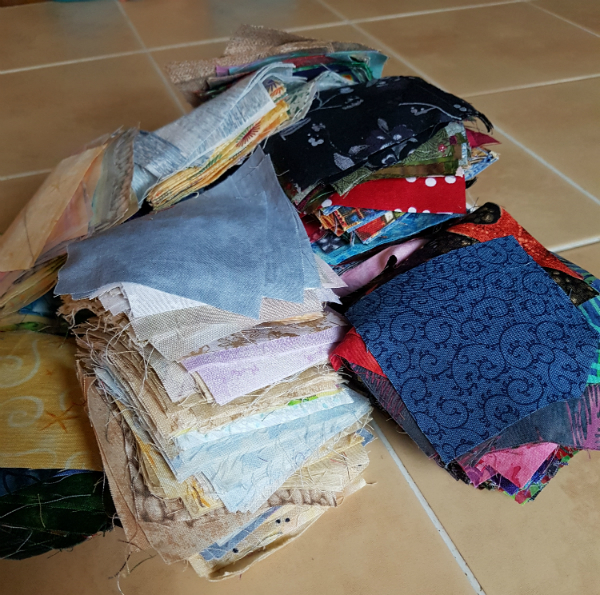 I have 190+ scrappy nine patches that will be used to make a design called Rick Rack Nines. And I have a scrappy tumbler project going also. I can't bear to throw fabric away, not when it's 11-12 dollars a yard! I don't make them -- don't think about it until someone does a post. 1.5 inches?? Yikes!!!! !